This excellent slice of gospel soul finally arrived yesterday, and I had planned on featuring it the day it arrived, but responsibilities got in the way. Instead, tonight, I am going to ignore my desire for sleep and get this together before a few more weeks get away from me, which is often the case these days. This tune has such a rich musical texture: opening with a cascading harp, bass, congas, and a steady hi-hat, the guitar and strings come in, only to have it all drop of for a drum solo. All this in the first 45 seconds or so. And then the tune takes off. 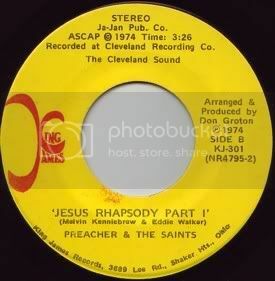 Several times, the group takes a step back and the chorus sings "Jesus, Lord Jesus", and the tune returns to the instruments present at the very start - the harp, bass and congas - as if the they are catching their collective breath before the guitar and string comes in and it builds again, this time into the lead singer's vocal crescendo that could rival some of the best soul and funk records out there. The prescence of so many instruments is just amazing - the harp paired with the bass, the guitar with it's effects, the congas underneath everything, the strings - it all sounds so good together. Makes me wish they'd release Part 2. This 45 was featured on the fantastic "Good God! A Gospel Funk Hymnal" released by Numero Group last year. A highly recommended compilation. I already heard Jesus Rhapsody and it's so nice. The combination of the percussion instruments is indeed nice! I am learning how to play congos and I wish to have my own recording also.